Welcome to the homepage of Hinckley and Burbage Lions Club which has been serving the local community for over four decades. Formed in 1973, it is comprised of around 20 like-minded people who believe in helping primarily their own community, but where necessary, the wider world as a part of the international Lions movement, whose motto is ‘we serve’ and that is what we have been doing since our formation. Since its birth, the club has raised hundreds of thousands of pounds for local causes. Recent donations have included donations to Hinckley Tennis Club to promote coaching for disabled and able-bodied youngsters to get involved in the sport. Others include Lawrence House, which provides shelter for the homeless, local First Responders, Hinckley Guides, Westfield Junior School as well as help for Hinckley Museum towards new lighting facilities. Members also volunteer for the annual collection for Marie Curie Cancer Appeal, and run an annual sponsored walk around Bosworth Battlefield. Other fundraising activities include collections at supermarkets over Christmas, quiz and race nights, a barn dance and a casino night. We meet monthly for a business meeting presided over by an elected President, and also run regular social events. If you would like to join us you are most welcome to do so by attending one of our meetings, held at the Plough Inn, Hinckley on the second Monday of the month, with a 7.30pm start, by phoning 0845 833 5892, or emailing our Membership Officer, Robin Wilson, on robin.wilson14@btinternet.com. We do not usually boast about what Lions do but one of our members, Lion David Phillips, achieved 50 years of Lions membership this year and we think that is worth shouting about. It was a proud night for Hinckley and Burbage Lions Club, when they celebrated their joint Charter Night with Barwell and Earl Shilton Lions Club at Hinckley Golf Club on 16 February, 2019. One of Hinckley and Burbage members was presented with a very prestigious award for his unstinting service to the Lions over half a century. 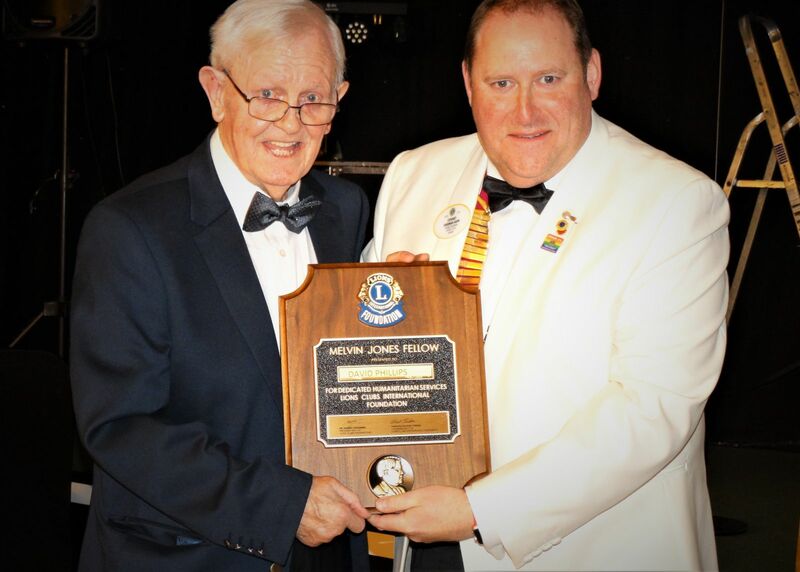 David Phillips, who has completed an amazing 50 years’ service with the Lions, was awarded the Melvin Jones Fellowship for his outstanding contribution over many years. This is given in memory of the founder of the Lions and is one of the top honours available. David’s journey in the Lions began when he joined the Swansea club in 1969. Since then, his career has taken him all over the country, but wherever he worked, he also joined the local club, including membership in Worcester and Wakefield, before joining Hinckley in 1982. Mr Phillips is a Past President of Wakefield Lions Club and a three times Past President of the Hinckley & Burbage Club, as well serving as Zone Chairman on two occasions. As well as being an ardent supporter of Welsh Rugby Union, David also represented Wales at Table Tennis. Throughout his 50 years of service to the community, he has always been ably supported by his wife, Jean, not only fulfilling the "we serve" part of Lions, but also taking a very active part organising and participating in social events.